UPDATE 2 April 2019: Hallstar Beauty wins Best New Ingredient Silver Award for LOOK Oléoactif®! LOOK Oléoactif®, a 100% vegetal, eco-designed, substantiated ingredient extracted from the bark of the ayurvedic Arjun tree, is the first all-natural active dedicated to eye contour rejuvenation. 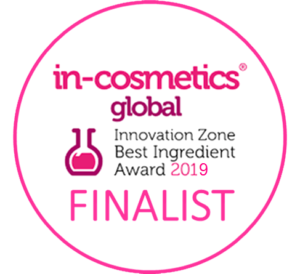 We are proud that in-cosmetics Innovation Zone team of judges has named this new active natural as a finalist for the 2019 Best New Ingredient Award. This revolutionary functional ingredient boasts superior emolliency with anti-oxidant benefits. Its light, dry sensoriality is derived from olive oil and olive leaves. COSMOS-approved, 100% natural and globally compliant, it is a sustainable alternative to silicones. Two years after Hallstar’s Micah® won the New Ingredient Silver Prize at in-cosmetics, we are excited to be presenting brand new in vivoclinical data in Paris about this revolutionary anteoxidant. We looked at UV and visible light’s impact on DNA damage, inflammation, and ROS creation with or without Micah®. You’ll be amazed at the results we found. As always, Hallstar will bring to in-cosmetics many of its newest formulated solutions for you to see and feel. Our collections will include baby care, make-up, sun care, active naturals, and “Beautiful Dreamer, a special kit focused on the connection between a good night’s sleep and healthy skin. Visit us at Booth R100!